HÀ NỘI — The nation’s population policy must be integrated with other socio-economic factors including national defence and security to ensure rapid and sustainable development, experts said yesterday. They were speaking at a policy dialogue on population and sustainable development organised in Hà Nội to discuss the draft Law on Population. The draft law will be submitted to the fifth National Assembly session for discussion. Trương Hải Cường, member of the Việt Nam Fatherland Front (VFF) Central Committee, said the country’s population was aging rapidly, so the draft law should have provisions that ensure the rights, interests and responsibilities of the elderly, and encourage senior citizens to do suitable jobs, based on their health and experience. 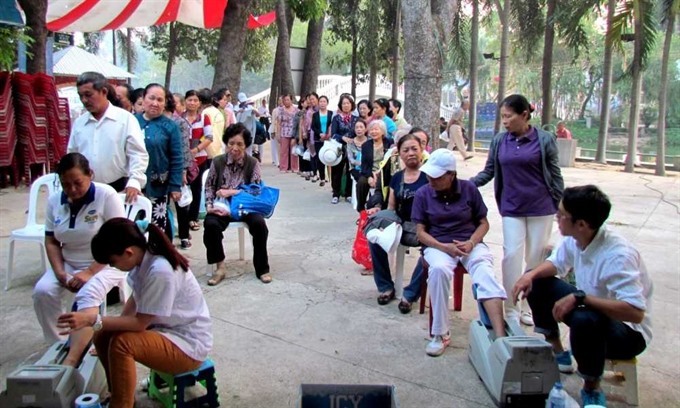 Quách Sỹ Hùng, also with the VFF, said the draft law should have clear regulations on responsibilities of relevant ministries and agencies on family planning services and taking care for old people. International principles and commitments should be adhered to in building population policies, said Nguyễn Ngọc Quỳnh of the United Nations Population Fund (UNFPA) in Việt Nam. She said the draft law should meet international standards and comply with human rights principles, including the right to decide to have babies, time to have babies and the number of children. Regulations should ensure the provision of full and clear information, education and qualified services on reproductive health, with priority given to population in disadvantaged areas, she said. Dialogue participants also discussed and shared their experiences on the development and implementation of population and development policies; raising awareness and changing societal behaviour; and integrating population variables into development policies.